Search Minerals discovers two furth… | Search Minerals Inc.
Fox Pond and Foxy Lady prospects occur 8 km along strike from the Foxtrot Project (9.26 million tonne resource). The Fox Pond prospect has 7 channels, totalling 53.28m, and the Foxy Lady prospect has 4 channels, totalling 39.09m. 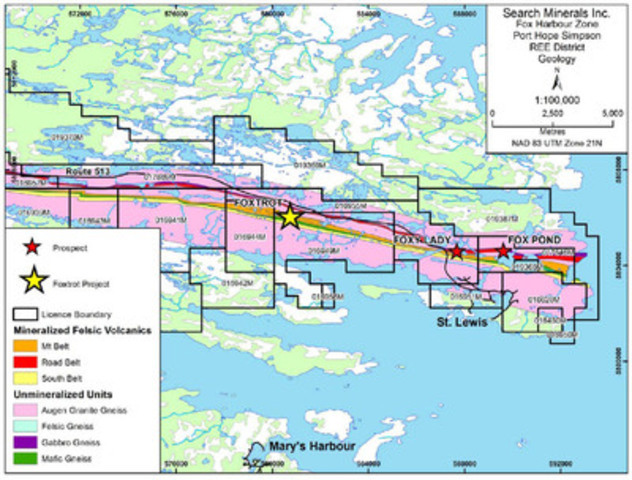 The Fox Pond and Foxy Lady prospects occur within the Fox Harbour mineralized belt approximately 8 km along strike to the east of the Foxtrot Project. They are located near the port of St. Lewis (see figure 1 below), within 2 km of tidewater and 1km of the road network. The rare earth mineralization is found in strata-bound, fine-grained, felsic volcanic units that are correlated to the Foxtrot Project felsic volcanic sequence and for which Search recently released an initial NI 43-101 resource estimate. (see Search’s February 13, 2012 news release). Initial exploration, including regional mapping, grab samples, and channel sampling, at Fox Pond and Foxy Lady, yield similar rock types, mineralization styles, and REE values to those at the Foxtrot Project. Weighted averages from Fox Pond channel FPC-11-06 assayed 236 ppm Dy, 1282 ppm Y, 13,276 ppm Zr, 1998 ppm Nd, and 1.18% TREE+Y over 2.49 m. Weighted averages from Foxy Lady channel FLC-11-02 assayed 197 ppm Dy, 1016 ppm Y, 12,993 ppm Zr, 1377 ppm Nd, and 0.81% TREE+Y over 5.16 m. Table 1 highlights assay data from 2 channels (4 intervals) and 2 hand samples collected from the Fox Pond and Foxy Lady prospects during the 2011 field season. Analytical techniques, sample preparation, and channel sampling procedures are outlined in Search’s July 27, 2010 and September 8, 2010 news releases. General prospecting, channel sampling, and geological mapping will continue on the Fox Pond and Foxy Lady prospects in the 2012 summer field season and both prospects are expected to be drill program ready by Q3 of the 2012 field season. Table 1: Assay Data for 2011 Field Season Grab Samples and Channel Samples.